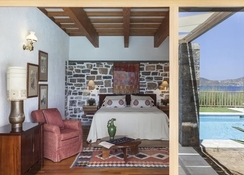 Enjoy the Mediterranean like never before at Elounda Mare Hotel Relais & Chateaux on your dream holiday in Crete. Take advantage of the beachfrony location of this top hotel in Elounda. Let your thoughts wander outside on the terrace, the balcony, the garden or the sun terrace in the 5 star hotel in Greece. With its 93 rooms, the exquisite 5-star luxury hotel invites guests to linger and relax. The rooms are spread over 6 floors overlooking the bay. To our delight, pets are also welcome at the hotel. For exploring the surrounding area guests can find a bus station at a distance of about 900mts from the hotel. Elounda Mare Hotel Relais & Chateaux organizes for a private transfer from the airport, while the village of Elounda is about a fifteen minutes’ walk from the hotel. Nearby is the Porto Elounda Golf resort (500m) and the Helraklion Airport is about 69 kilometres away. 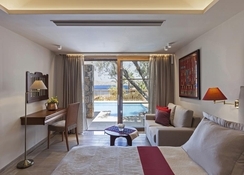 Guests can choose from sea view rooms and suites, bungalows with private pools, Minoan Royalty suites with private pools and Minoan palaces with private pools. Spacious living rooms, a stylish lounge, a separate bedroom and a balcony, - all these amenities feature your room along with stunning sea views. The bathrooms include a luxurious spa bath, a large bathtub and a shower. A fluffy bathrobe and comfortable slippers are at your disposal. For a leisurely evening in your room at the Grand Hotel you will find a TV with DVD player - a CD player offers additional variety. In the room a telephone is installed. The amenities of your room includes an in-room safe and a well-stocked minibar. Make your holiday with culinary delicacies a pleasurable experience at Elounda Mare Hotel Relais & Chateaux. The hotel offers a total of eight restaurants serving Greek, Mediterranean and International cuisine. Enjoy a relaxing evening at five bars and lounges. At the Hotel, the kitchen team invites you to dinner and breakfast buffet. With the right wellness and beauty program, your holiday at the Greek 5 star luxury hotel Elounda Mare Hotel Relais & Chateaux will be a true relaxation experience. You can visit the hot sauna or pamper yourself during your stay in the soothing steam bath or the luxurious whirlpool. 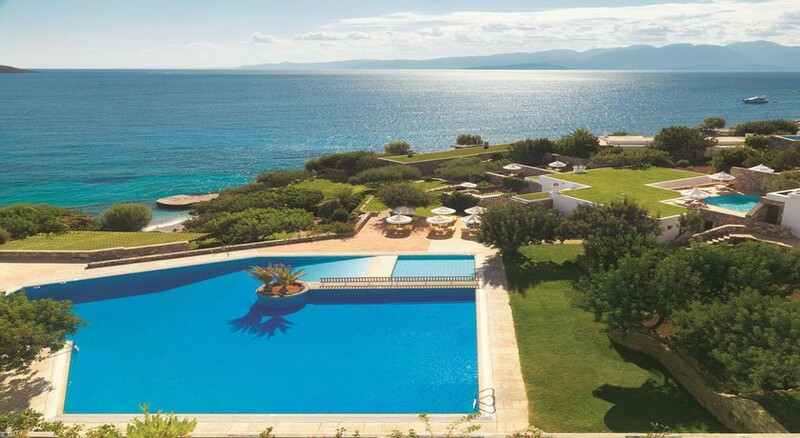 Located near the sandy beach in Greece, the hotel offers ideal conditions for boisterous bathing fun in the sea. For the perfect day at the beach, you will find comfortable sun loungers, parasols and towels provided by the hotel. 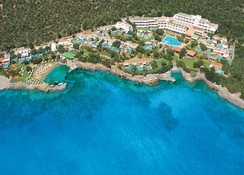 In Elounda Mare there are various ways to power up: the offer includes golf and tennis. On the beach, the offer includes water sports, surfing, windsurfing, jet skiing, diving, sailing, motor boating, pedal boating and canoeing.